Missing your tax-deductible receipt? Email us at info@jgbfundforthefuture.org. To shop at AmazonSmile, simply go to smile.amazon.com from the web browser on your computer or mobile device. You will see eligible products marked "Eligible for AmazonSmile donation" on their product detail pages. 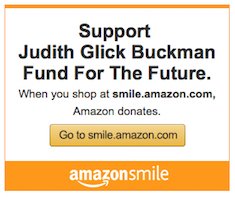 On your first visit to Amazon Smile, select the Judith Glick Buckman Fund for the Future to receive donations from eligible purchases before you begin shopping. The AmazonSmile Foundation will donate 0.5% of the purchase price from your eligible AmazonSmile purchases. Add the Judith Glick Buckman Fund for the Future as your favorite charity on eBay. You'll be prompted to donate when buying or selling on eBay.